This handheld ultrasound scanner machine is feathered in lightweight (750G), easy hand carrying, accurate imaging and simple interface. There are two difference kinds of probe, dual frequencies ultrasound scanner machine selectable in our company offer more widely range of applications. And special designed ones also available per customer. Those machines allow quick and easy diagnosis for Uterine, ovarian examination, pregnancy detection and sexing. 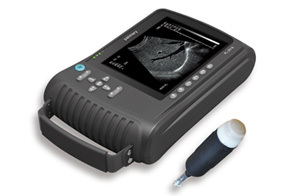 We are a manufacturer and supplier of Veterinary Handheld Ultrasound Scanner in China. Based on the advanced technologies abroad and at home, our Veterinary Handheld Ultrasound Scanners have passed the certification of CMD, ISO and CE, and our products have been well received by customers all over the world, such as Syria, Kazakhstan, Germany, Italy, Sweden, Romania, South Africa, Egypt, Ecuador, Uganda, Bolivia, Paraguay, Uruguay, Mexico, the United States, Canada, Argentina, Peru, and many other countries and districts. If you're interested in Veterinary Handheld Ultrasound Scanner, please don't hesitate to contact us freely.